Product prices and availability are accurate as of 2019-04-19 06:01:51 UTC and are subject to change. Any price and availability information displayed on http://www.amazon.com/ at the time of purchase will apply to the purchase of this product. 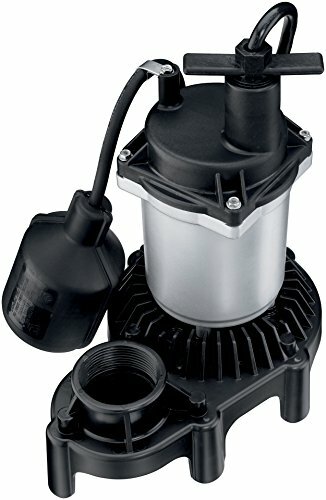 Flotec sump pump, submersible, series: FPZS33T, 3600 gph, 1-1/4 in inlet, 1-1/2 in NPT outlet, 22 ft head, 1/3 hp power, 115 vac, 60 hz, 8 ft cord, 32 - 70 deg F, thermoplastic, CSA, cus certified. Flotec has been the leader in residential water management products at retail locations for over 30 years. Flotec offers a wide range of products for water movement and storage, including sump pumps, sewage pumps, utility pumps, jet pumps, sprinkler pumps, pool pumps, submersible well pumps, pressure boosters, and tanks. Flotec provides you with solutions for your entire home.